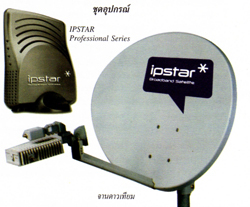 Utilizing IPSTAR technology, Star express provides a two – way satellite broadband internet service through Shared Bandwidth* , enabling high speed data transmission at 256 Kbps up to 2048 Kbps (best effort). Its Dynamic Bandwidth Management allows flexible bandwidth allocation for users to connect to the internet on an on demand and burstable speed. Star Express is suitable for small and medium enterprises (SME) , government organizations, or education institutions requiring normal or occasional usage of broadband internet at a competitive price. Star Express service is available in all 76 provinces throughout Thailand. High speed Internet access service ideal for home or individual use with a single connection to PC. STAR Express – HOME is designed for general Internet applications requiring only one PC to connect to the Internet without extensive Internet usage. High speed Internet access service ideal for small and medium enterprises (SMEs) requiring simultaneous internet connections from more than one PCs. STAR Express – SME is designed for small business or office usage requiring 1 – 5 PC connections to Internet with moderate Internet usage. High speed Internet access service ideal for medium size businesses requiring simultaneous Internet connections from more than one PCs. STAR Express – CORPORATE is designed for corporate departments or organizations requiring 1 – 5 PC connections to the Internet, demand fixed IP and medium to high Internet usage. 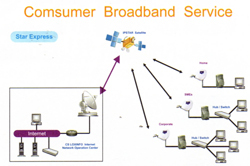 STAR Express is the broadband Internet access via satellite designed to allocate the downlink (receive) channel than uplink (transmit) channel with a shared bandwidth. Therefore, it is not ideal for some applications such as setting up for Web Server or Mail Server which requires more data transmission than data reception or some applications that require continuous transmission large amount of data such as CCTV, VDO Conference, Streaming Server (VDO and Audio), etc. These applications would affect the overall speed of your Internet connections. 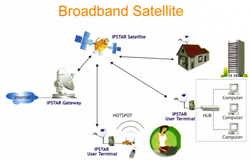 • STAR EXPRESS is a broadband internet service with Shared Bandwidth concept. The access speed is depending on the number of concurrent users. • The maximum speed of service is not the speed for download or uploads data which is depending on the number of concurrent users. High speed Internet access service ideal for medium to large organizations requiring Dedicated Link with full control of the Internet. The transmission is asymmetric for both uplink and downlink. Therefore, it is best for simultaneous Internet connections with multiple PCs* using various applications or set ups such as Web Server, Mail Server, CCTV ,Video Conference and etc. • มั่นใจในคุณภาพ พร้อมทีมงานผู้เชี่ยวชาญให้บริการตลอด 24 ชม.